For the seven young men in the Hypnotic Brass Ensemble, ‘brotherhood’ is literal: they’re all sons of jazz legend Phil Cohran. Raised on Chicago’s South Side, the boys joined the family band at age four, learning to play the trumpet, tuba, drums, French horn, cornet, and trombone. Now young men in their 20s and 30s, they make transcendent music that ties jazz and funk to soul and hip-hop. Together they have toured six continents, playing with iconic artists such as Prince and Mos Def. Now, the “bad boys of jazz” make their way to State Theatre New Jersey for a mesmerizing night of music on April 4, 2017 at 8pm. 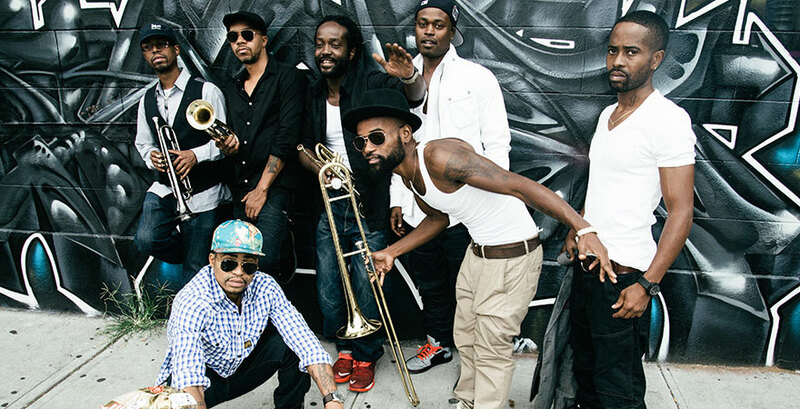 The Hypnotic Brass Ensemble (HBE) consists of seven brothers who come from an extraordinary musical family. The brothers were raised in a house where music was a constant element of the household, spending time around names like Chaka Khan or Earth, Wind, and Fire, a group that their father Phil Cohran was a member. Cohran’s “Circle of Sound” often held rehearsals in the living room and put on live shows in the adjacent loft/theatre called the “Sun Ark.” The brothers consistently had to wake up at 6am and play their horns before and after school. As adolescents, they played around Chicago as the Phil Cohran Youth Ensemble, performing the complex original jazz compositions of Cohran, Duke Ellington, and Count Basie for the likes of Harold Washington, Nelson Mandela, and other prominent figures of the time. Listen to member Gabriel Hubert talk about meeting famous jazz musician Wynton Marsalis for the first time in our recent interview. By the time the brothers reached high school, many of them decided to take a break from music. After enduring the deaths of close friends and family, including brother Anthony Neal, close friend Robert Lock (for whom they later wrote a song entitled “Flipside”), and Level Todd (for whom their song “Todd” was written), they decided to pick their horns back up. In early 1999, the brothers began performing in the subways of Chicago to present their music. Although the group’s early musical training encompassed primarily elements of instrumental performance, the brothers were personally being exposed to the music of their own generation like hip-hop, rock, and reggae and absorbed these components into the cosmic jazz style of their father. By the end of 1999, the band of brothers discontinued playing with their father in order to find their own sound, growing into the band now known as the Hypnotic Brass Ensemble. HBE recorded their first project, Flipside, in 2004 and have since performed at Coachella, WOMAD Australia, Jazz at Lincoln Center, The Sydney Opera House, and Carnegie Hall. In 2012, their song, “War,” was featured in the hit movie, The Hunger Games. The PBS documentary film Brothers Hypnotic explores their music, work ethic, life, and experience of being raised by legendary jazz trumpeter, band leader, and father, Phil Cohran. The Hypnotic Brass Ensemble has grown into an even newer sound with their latest efforts, BulletProof Brass and Fly, and are now gearing up to release a new installment called Bad Boys Of Jazz. Feel the energy and excitement of the Hypnotic Brass Ensemble at The State on April 4, 2017 at 8pm!